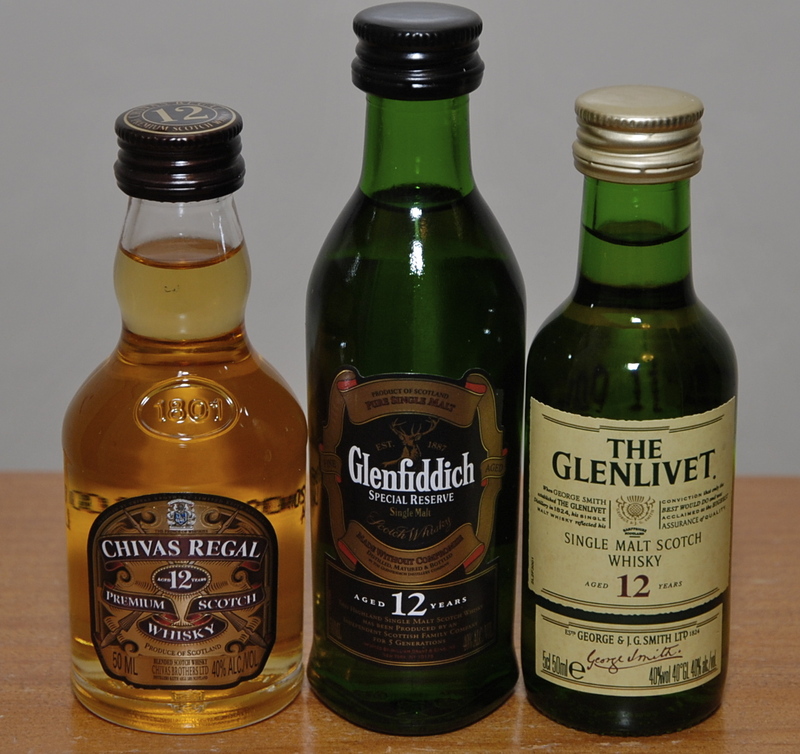 I recently purchased miniature (50ml) bottles of Chivas Regal 12, The Glenlivet 12, and Glenfiddich 12 so that I could compare the three and see if any one of them stands out as an entry level value for a “light” whisky. When I call them “entry level” whiskies, I mean that in two ways. First is price. I can get Chivas for $20 and the ‘livet for $26. The ‘fiddich 12 has gone up recently in Phoenix, and now goes for $35, but it used to be closer to the Glenlivet. The other way you might consider these to be entry level whiskies is in the approachability of the flavor. All three are very light drinks, and are significantly less imposing on scotch newbies than, say, something from Islay. For this comparison, I was especially curious about the Chivas Regal 12 given the lower price (at least locally), and wondered if it could stand up to the single malts. On the nose, all three start out at with a common base of apples and pairs, with the Chivas perhaps offering up some peaches as well. All three are also sweet, but they diverge here, with Glenfiddich reminding me of brown sugar, Chivas Regal being more caramel/butterscotch, and the Glenlivet having a lighter honey sweetness. The Glenlivet also stands out as being more floral (and a bit more lively) than the other two. The Glenfiddich seems to have a maltiness, and perhaps a little bit of mixed nuts that I didn’t notice in the others. The palate is pretty tame for all three. The Glens retained their fruit flavor, and the malty flavor from the Glenfiddich nose is evident in the mouth for both. The Chivas Regal seems to be more on the sweet side in the mouth, with the caramel/butterscotch continuing. I’m also getting what I perceive to be a walnut-like bitterness with both the Glenfiddich and the Chivas. Once again, I feel like The Glenlivet is just a touch more lively, with the Chivas being the weakest. On the finish, there’s nothing to write home about for any of these. The finish just isn’t where it’s at for these whiskies. Once again, the Chivas is the weakest. It just goes away as soon as you swallow it. The malt flavor on the two Glens comes up through the nostrils a bit, as does the floral element on the Glenlivet. As you might have guessed from my notes, I didn’t find any of these to be “remarkable.” However, that doesn’t mean I don’t like them. I thought all three were very pleasant on the nose, and they were extremely easy to drink. All three have a very light profile that makes them suitable for any time of day. Being into whisky as a hobby, I’ve got a pretty good stock at home, and I don’t plan to rush out and buy any of these. However, if I find myself killing time in an airport lounge some afternoon, I won’t hesitate to order any of these three easy drinkers. Rather than posting a bunch of links for all three whiskies, I’ll just point you to a YouTube video review for each one. You won’t have any problem finding other opinions with a Google search. Glenfiddich 12 [ralfystuff] – Ralfy also reviewed The Glenlivet 12 here. as far as the chivas, it’s overpriced here in israel and i think it’s not as good as the livet. great comparison,keep it up. we love the theme. Yamazaki 18 is very fine and you have astutely noted the only flaw’ being that bitetr note on the finish. It’s not cheap, but worth every penny. Cool comparison– without having examined any of these closely in a while, I’d still tend to agree with most of your assessment. Glenlivet just slightly over ‘Fiddich, for sure. We’ll have to do a 40/40 for that one. I like having the video tastings to check out. Even though I generally think Peatluvr’s “tastings” are utter nonsense, I’m starting to like this guy. I just think Peatluvr’s videos are fun. He’s got a likable personality and really enjoys his whisky. Check out my post on White Horse Extra Fine. THAT’s one for your 40/40 series…although I suppose the ‘livet 12 is certainly worthy.